Spirit of Scotland was the first stop on a recent journey through south west Scotland on which I explored some of its landscapes, heritage and art. 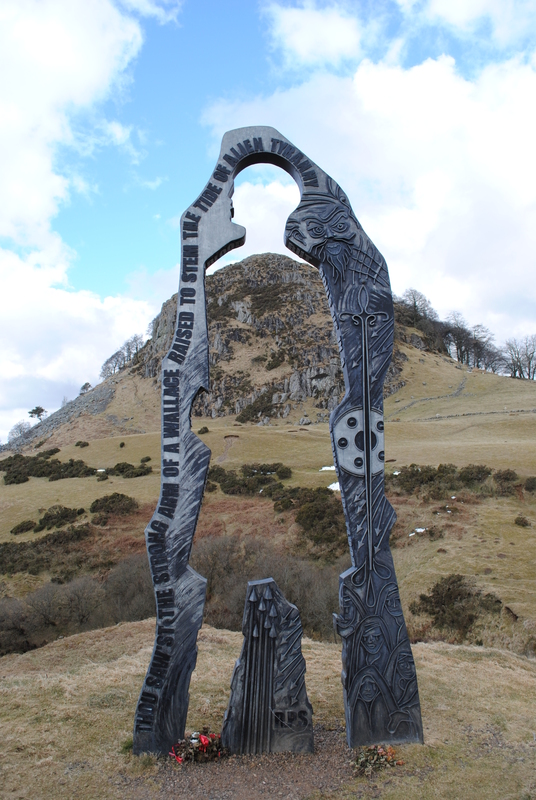 Spirit of Scotland is a sculpture set at the foot of Loudon Hill, a granite volcanic plug, and striking feature in the landscape from some distance away. 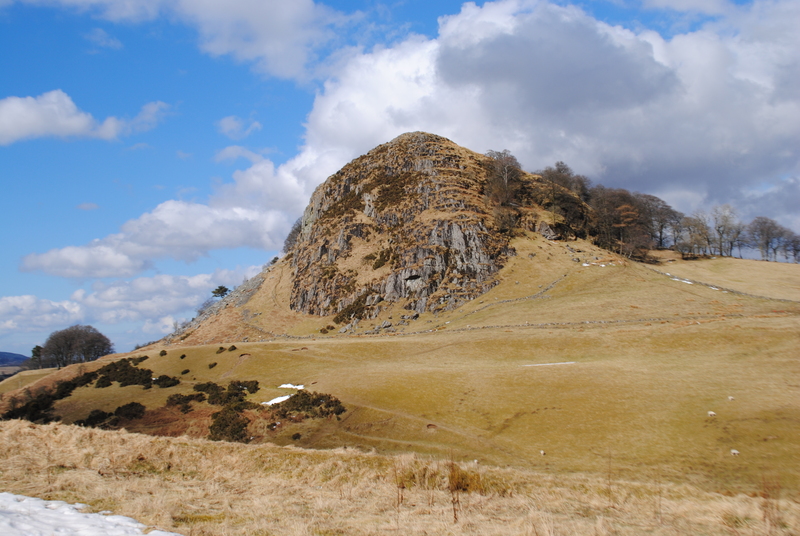 Loudon Hill is located at the head of the Irvine Valley, a strategically and historically important location and route way for some millennia as evident by the close proximity of a Neolithic long cairn (c 5500 years ago) and a Roman Fort (c 2000 years ago). Spirit of Scotland by artist Richard Price was erected in 2004, by the Irvine Valley Regeneration Partnership, and is located on a pathway which runs through the Irvine Valley. The piece is of fabricated steel and stands over 5 metres tall. 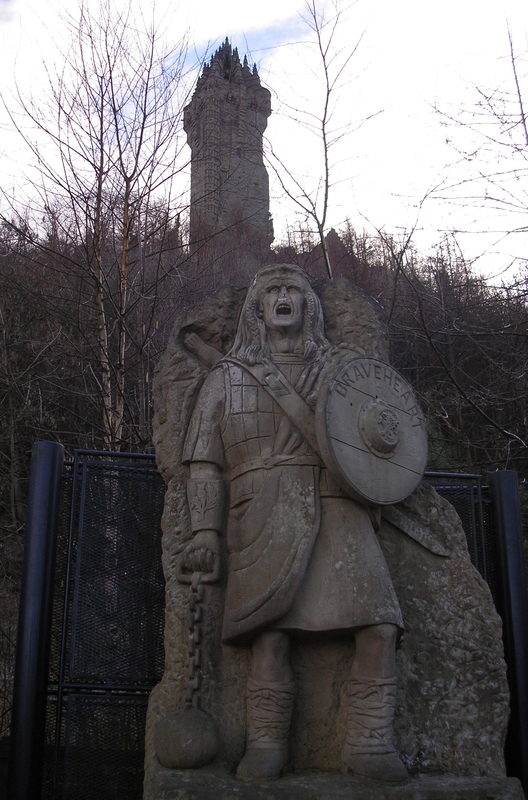 It is located in close proximity to the Battle of Loudon Hill, involving Robert the Bruce in 1307, and the words and imagery on the sculpture refers to another important historical figure William Wallace who was said to have won another battle here in 1296 : for further details see Historic Scotland’s Inventory of Historic Battlefields. The cut out human form can be used to frame different views of the hill and the wider landscape beyond but it was the words on the sculpture, comprising three short phrases of archaic tone, to which I was most drawn. Subsequent investigation suggests that two of the inscriptions appear to have literary origins: evoking a broader body of historical narrative and wider cultural associations. 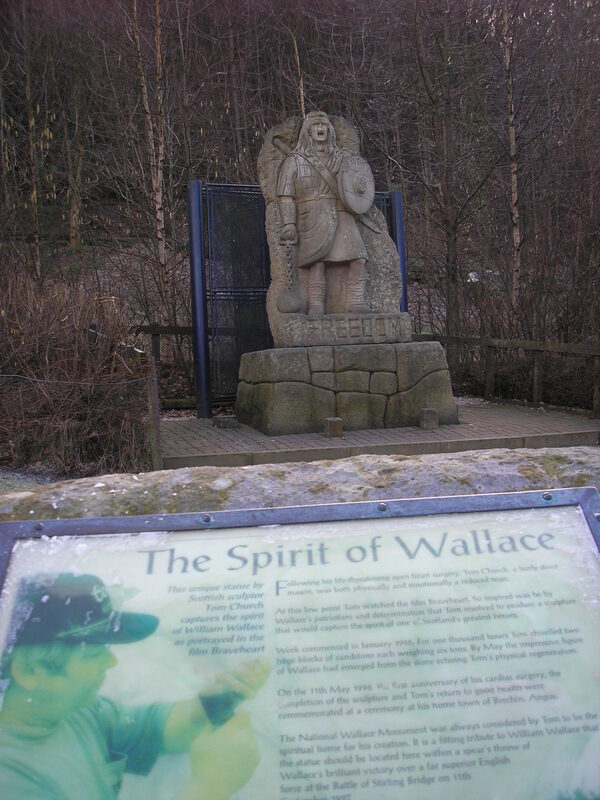 The words from the side facing Loudon Hill (The Knyght Fenwick that cruel was and keen he had at death of Wallace’s father been) appear to derive from Blind Hary’s 15th century poem The Actes and Deidis of the Illustre and Vallyeant Campioun Schir William Wallace (simply referred to as The Wallace) which was the basis for The History of the Life and Adventures, and Heroic Actions of The Renowned Sire William Wallace by William Hamilton in 1799 (see page 51). 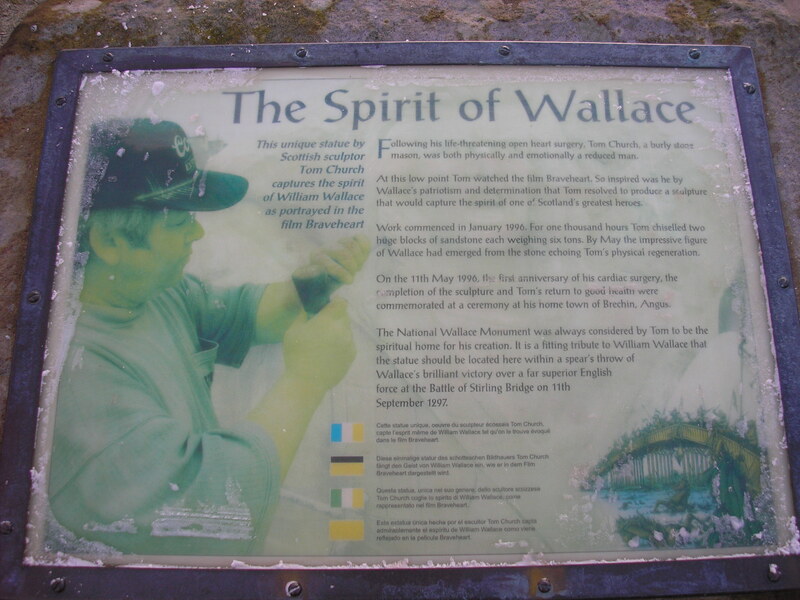 While the words on the inner arch ‘ At Wallace nam what Scottish blood but boils up in a spring tide flood‘ come from The Bard in 1785 in an Epistle to William Simpson of Ochiltree: which can be listened to from the link. 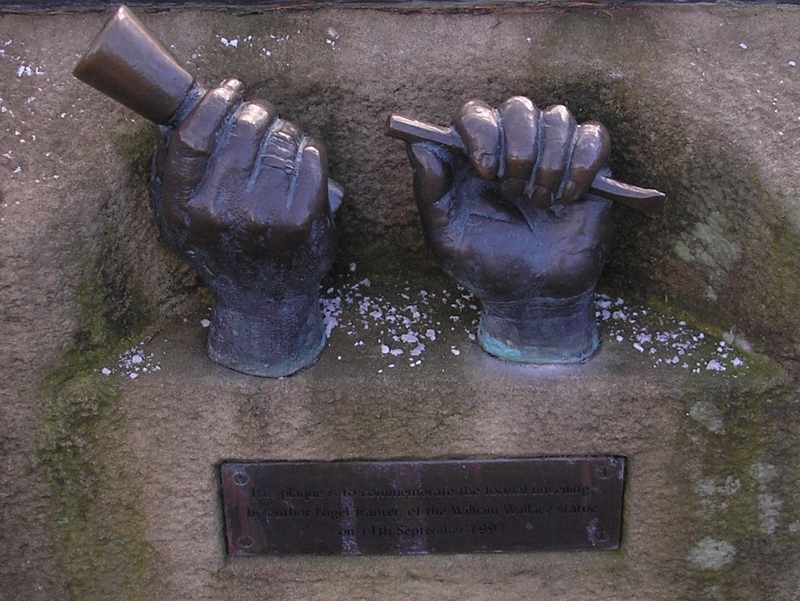 I am not sure where the third phrase (Thou saw’st the strong arm of a Wallace raised to stem the tide of alien tyranny) derives from, whether it is a modern evocation by the artist, or whether it has another direct literary reference ? If you have any ideas please let me know.